Next on the foodie agenda was Dinah's Famous Chicken. Admittedly this ain't Thomas Keller's fried chicken but I cannot resist crispy-on-the-outside, moist-on-the-inside fried chicken. Although they don't serve the kinda southern style sides I like (collard greens, sweet potatoes and red beans and rice,etc.) I still love Dinah's chicken with green beans and smashed potatoes. And even better, it is on the way to LAX. A happy camper at Dinah's. Next up: pancakes at the LA breakfast institution "The Griddle Cafe." 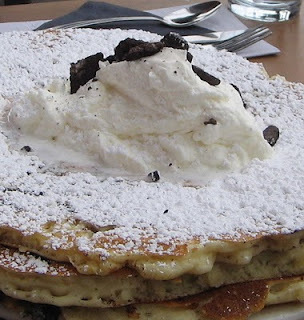 Snow-covered mountains or Oreo Pancakes? Modern art or nutella-stuffed French Toast? An honorable mention for Pupuseria del Valle in Burbank, CA. Tuesdays are $1 pupusa day. I don't have pictures of these delectable, cheesy corn cakes cuz they simply did not last long enough to be photographed. This concludes our culinary tour. We pigged out so much that we forgot to find the Korean BBQ taco truck. There's always next time.